The political debate about the proposed 20th Amendment needs to be considered in the national perspective. The JVP’s proposed amendment is intended to abolish the popularly elected executive presidency and replace it with a significantly less powerful presidency to be elected by parliament rather than by the people. Those in the political opposition are currently the most vocal in their opposition to the proposed amendment. Those on the government side have been more or less silent so far. An exception has been government minister Mano Ganesan who heads the Tamil Progressive Alliance. He has said that his party which is part of the government alliance will not support the amendment. Over the past decades, it has been the view of the ethnic minority parties that the popularly elected executive presidency is better for them. It is an elected office where their votes count, and those who seek to be elected as president have to accommodate the ethnic minority positions. The issue of the executive presidency is an ongoing subject of negotiation within the government coalition. At the level of policy, the main argument against it is that it is too powerful an institution and has been abused in the past. But there is also powerful opinion in favour of it. This is that unless the country has a single center of power, the devolution of power will lead to divisive tendencies that the system will be unable to check. The ethnic minorities too seem to prefer the continuation of the executive presidency as they see in it as a central institution that they can impact on directly through their vote. So far no opinion on the subject has been expressed by other senior members of the government. The likely scenario is that there are calculations being made regarding the advantages and disadvantages of the abolition of the elected executive presidency to themselves and to their political parties. Invariably many of those who are leaders of the government and opposition would see themselves as potential presidential material. When contemplating changes in the fundamental law of the country, which is what constitutional change is about, it is important that the long term and best interests of the country be looked at rather than the interests of individuals and their political parties. The problem with competitive party politics is that ambitious politicians tend to look at the short term and what is in their own interests. The danger is that public opinion will follow suit. JVP Leader Anura Kumara Dissanayake who proposed to bring the 20th Amendment as a Private Member’s Motion is reported to have said the president would be appointed by parliament under the proposed 20th Amendment. He said that according to the draft amendment, the president would continue to be the head of state and the commander-in-chief of the armed forces, but he would no longer be the head of the government and the head of the cabinet of ministers. The executive presidency is the single most powerful in the current scheme of governance. The president is the head of state, the head of government, the head of the cabinet of ministers and the commander-in-chief of the armed forces. The entire design of the 1978 constitution which established it, and in which it is embedded, is based on the central pillar of the presidency. Therefore, the excision of the presidency will have a major impact on the strength of the rest of the constitutional architecture. A key feature of the proposed 20th Amendment is to transfer the powers of the directly elected president to the prime minister who is the person who commands the confidence of the majority in parliament. The recent vote of no-confidence in the prime minister shows that the prime minister’s position, unlike that of the president, is not a guaranteed one. The prime minister can be removed early in his or her term. On this occasion the prime minister survived the vote of no-confidence against him. On another occasion he might not. By way of contrast, in terms of the present constitution, the president is virtually unassailable, and immune to being removed during his or her term of office. There was an attempt to impeach President Ranasinghe Premadasa in 1991. But the president had an arsenal of options at his disposal to neutralize his opponents, which he succeeded in doing. These included acceptance by the speaker of parliament of the motion of impeachment, a 2/3 majority in parliament, and the provision of patronage to win the hearts and minds of those who might have voted against him. A major concern is that a country as diverse and with internal conflicts like Sri Lanka needs a single institution to which all groups, racial, religious and regional, can look to and must look to in order to have unity in diversity. There are countries that are more diverse and with more internal conflicts than Sri Lanka. They function under non-presidential systems. However, at a time when there is widespread disillusionment about the quality of political leadership in both the government and opposition, the need is to strengthen institutions, and not to weaken them. This can best be done by holistic reform rather than by piecemeal efforts. The government media has reported that the steering committee of the constitutional assembly will resume its meetings from May to revive the constitutional reforms process after a hiatus of about five months. The constitutional reform process has been in abeyance since late last year as the internal issues of the government and local government elections came to the fore. The process was almost stalled after the five-day Constitutional Assembly debate of Interim Report of the Steering Committee in November last year. However, it is reported that the Constitutional Assembly Secretariat was working throughout the period to incorporate the amendments that came up during the debate. Both public opinion polls and prevalent public opinion on the street have shown that most of the population believe constitutional reform is important. From the time that the present constitution’s executive presidential system was first subject to abuse, academic and civil society opinion formers have critiqued the constitution and called for its replacement. Therefore, the popular movement to change the present constitution has a much longer history than the government’s present bid to formulate a new constitution. The decision whether to abolish the executive presidency or reform it needs to be taken with the long term perspective of strengthening institutions in mind. The anti-Muslim riots which continued for a week and the failure of the police to act effectively to stop them and to bring the wrongdoers to justice is reflective of the continuing weakness of state institutions. Security forces personnel I have had occasion to speak to in university educational settings, where free exchange of ideas is paramount, have said that they feel vulnerable. If they do their duty under one government, they risk being punished under another government. If they do not follow orders they feel may be illegal, they risk being punished by over-powerful politicians. For its longer term progress Sri Lanka needs strong institutions which both protect those who do their duty and also hold those who abuse their powers accountable. This cannot be done through ad hoc and piecemeal constitutional reforms. If the abolition of the executive presidency is to take place, it should be within the framework of comprehensive constitutional reform as initially envisaged by the government when it transformed the entire parliament into a constitutional assembly and appointed an all party constitutional steering committee to lead the reform process. Sri Lanka is in a catch-22 situation. What if you keep the Executive Presidency and end up in a person who abuses his powers? What if you abolish the Executive Presidency and end up in a Prime Minister who abuses his powers ? Will the constitution protect the rights of all races, castes, and religions ? Who is going to ensure checks and balances in a culture where corruption is the name of the game ? Who is going to stop people taking the law into their hands ? …… the queries can go on and on. Jehan Perera has written a real anti-ethnic minority article. what you are saying as the Executive president is pro-ethnic minorities cancels EP and give what ever the Ethnic minorities want via the constitution. How about religious minorities.Are not they discrminated then ? You write many such sound articles, very well balanced, and that is important. The very existence of Face Book and even this site tend to encourage clever one line responses. I haven’t often posted responses to your articles because you do show awareness of many aspects of any issue. This is just to say “Thanks”, because too many dismiss what you say as being designed to satisfy NGOs. That last is a lazy comment from those too lazy to read – includes me sometimes! Yes Jehan agreed with your article. Executive Presidency has to be abolished. Most importantly International Judges has to bought in as our Justice system has failed miserably. The minorities has been at the receiving end for a pretty long time. There is nothing wrong with our Constitution. Other than those who are funded by NGOs/INGOs, all Sinhalese are against the abolition of the Executive Presidency. The proposal to elect the President by the Parliament is a joke. People don’t have the right to elect the PM. Therefore, they should have the right to elect the President. Anura Kumara’s proposal to discontinue the President from acting as the Head of the Government and Head of the Cabinet is insane. What is he for then? Who wants a reincarnation of William Gopallawa? Retaining the Executive Presidency is ultra necessary for protecting our independence and sovereignty and maintaining peace and security in the country. For an eg: If there wasn’t an Executive President, Digana incident would have been surged across the country in an uncontrollable manner as Anura Kumara’s model President has no power to declare State Emergency without the consent of the Parliament. Even then there is no guarantee that he receives the approval. Most public opinion polls are held by interested parties. They don’t carry the view of the majority general public. Public opinion on the street is for constitutional reforms? What a joke. The truth is the total opposite. No man in his right mind approves Yahapalanaya government’s bid to change the Constitution. What people want is to change the government, not the Constitution. This nation needs comprehensive constitutional reform to address the solutions to the problems that this country faced since independence. Whether it is powerful executive president or powerful executive prime minister it is the same. The real problem was the power remains in the hands of powerful ethnicity or powerful religious community. This country never had a constitution before British. The real problem created after British was the unification of different kingdoms that was in existed for many centuries. If you analyse the period from 1948 to up to date, there is a very clear significant relationship between the deterioration of rule of law, deterioration of justice system, deterioration of economy, increased corruption, increased misuse of power and the ethnic politics of the powerful community. The failure to implement Banda-Chelva pact to failure to the recent attempt to change the constitution was not successful because of the powerful community playing politics using racial card. Unless they play this game, they cannot get hold of power to cheat the poor Sinhalese community. For example, Mahinda (SLFP) promised to get rid of executive presidency was in power. He promised to go for 13+ but later turned against to both and play race card to come back to power after loosing his power because of his misuse of power, unlawful murders and corruption. Is it possible for come to power again without the race card by a man who is a well known murderer, misused his power to rob the public money? It is not a problem. It is a fact. 75% of the population is Sinhalese. 70% of the population is Buddhists. There is an ethnic ratio in this country. The problem lies with minorities who have forgotten that they are only a small fraction of the population. The rule of law & justice should be common to all citizens, not based on proportions of ethnicity or religion. You Sinhalese should not forget that you are a minority when compared to Tamils in this world. I don’t know you are aware that in Srilanka, it is a minority high class Buddhist Sinhala keep the power and wealth and oppress other Sinhalese. The number poor Sinhalese massacred by this upper class Sinhalese rulers (Westernised, Chrisianity background) are much more than they killed the minorities. Fully agree. There should be one law to all ethnicity and religions in Sri Lanka. I am glad you agree to abolish Thesavalamai Law and Muslim Law. Thank you. I have already written about the importance of electing the next President from the ordinary class. Yes. Sinhalese are a minority in comparison to the ethnic groups in the world which is why this country should remain as one country which is the only country in the world where Sinhala language is spoken and recognized. That is why this country should not be a federal state granting self-rule to Tamils in the North who have other countries where Tamil language is recognized as a state language, an official language and an working language. It is good that you agree that there is a discrimination since 1948 under Sinhalese lead govt. The brutality against minority will not guarantee the safety of Sinhalese and their language. Sinhalese now live in many countries including USA, Canada & Australia. For Srilankan Tamils, Srilanka is their motherland as Srilanka is the mother land for Sinhalese. There is no country for Tamils. The safety of Srilankan Tamils from Sinhalese can be only assured by a Federal Solution. If not, one day it may become a Muslim nation because there are number Muslim countries in this world. You yourself agreed that the countries where Tamils and Tamil language recognised are safer and in peace unlike Srilanka. Where was the discrimination? Give examples. No country has accepted Sinhala as a working language. But Tamil is accepted as a working language. In Tamil Nadu, Tamil is the state language. In Singapore, it is one of the official languages. UK, USA, Canada have also accepted Tamil as a working language for admin and educational services which is a rare privilege. It is you, not I, who said “You Sinhalese should not forget that you are a minority when compared to Tamils in this world.” By saying that, you have admitted that Tamils are recognized in other countries and that you have an advantage in terms of demographics of the world over Sinhalese. Is this the same Jehan who only last week wrote in support of abolition? “It is in this context that the JVP is planning to present its proposal to abolish executive presidency as the 20th amendment to the Constitution when the new Parliamentary sessions commence on May 8. The chances of success this time around, at getting rid of the executive presidency are better than ever before. President Sirisena, Prime Minister Wickremesinghe and former President Rajapaksa who leads the opposition to the government all have an interest in an alternative to the popularly elected presidency. This correspondence of interests is unlikely to occur again so if the presidential system is to be abolished or changed substantially, this is the best time. The JVP proposal for a 20th Amendment is therefore a response to a need at the present time. It is of paramount importance that the President must be elected by National consensus as the Parliament in all likely hood will be dominated by sinhala representatives and the election of a sinhala President will be a foregone conclusion. On the contrary if the President is elected by a presidential Election process as has been the practice it is more democratic and carries a greater honour and a prestige when elected Nationally. We are well aware of the calibre of our so called peoples’ representatives in parliament and we can expect a few Billions of Rupees changing hands to get another person who will succumb to any unlawful conduct as it is observed today. The executive President mania should be done away with and thrown out lock stock and barrel. He should be vested with the singular power of being the Chief Commander of the three forces. Our Nation has learnt bitter lessons resulting from decisions taken by past Presidents and the present one too and let us not create another monster. Good traditions have no place in our parliamentary conduct or procedures. We cannot trust them for a penny. Enough is Enough. Henry Fernando: IT is 200 million that changed hands in order to win the No confidence motion. so, it is reasonable to spend Rs One billion to elect a cmoon candidate president. So, Srilanka doe snot need another Economic vision . We can use important electiosn to bring money to the country. They will find it selling BEER, REAL ESTATE, CIGERETTES, CASINOS, Brninging foreign wommen, VArious kinds of MEdicnes that youth must use in order to stay alive. I understand how Ravi KArunanayake develop the country within 100 days. Our country will never ever be like Singapore, USA or India. Singapore had a Tamil and Muslim President. USA a black president under the name Hussain Mubarak Obama. India Abdul Kalam. 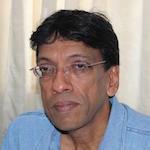 The Lankan Constitution has become an ambulance to provide temporary relief. We keep keeping it in running order with ‘Constitutional Amendments’. The mechanics are making lots and lots and lots of…….. The mechanics also stage the accidents. Lateral thinking is badly needed here and now. Violence started since independence in 1948. After seventy years it is time to review the effect of this. Do we have to abolish this Executive Presidency to find out what happens? NO LAWS TO CATCH THEM SO WE NEED SOME LAWS !!!! From 1948 our politicians have been drafting numerous constitutions , unfortunately still no one has met any prospect. Hope it will continue till human species are vanished. Jim Softy. You are right a common candidate with high morals, excelling in sterling honesty as the saying goes and who will not stoop low but respects the law and see that it is applied equally to every man and woman in our country, and that must be the main criteria. Unfortunately we have not been able to find one such individual in our society since we embraced or rather forced or compelled to accept the much hyped executive President concept. The present day politicians from top to toe are corrupt to the core, except for a very few who could be counted on our fingers who speak fearlessly and unless the general public support them they could be eliminated or sidelined by the leadership. We have seen this type of dirty political games in the past. It is the duty of all people of good will to to influence the society to groom a person above reproach to lead our country and such a plan we hope will be able to recuperate from the depths of mire we are entrenched in. We hope the present leaders will not repeat their old stunts to derail the will of the people. It would be good if Item 2 of chapter 1 of the present constitution is amended to read as ‘The Republic of Srilanka is a FEDERAL STATE consisting of two or more states”. Powers of the States and the number of state to be discussed keeping in mind the Tamils and Muslims . Chapter 11 to be amended to read as’ Srilanka will be a secular state with all religions given equal rights. The state shall not favour any religion subtly or otherwise The agnostics and free thinkers also shall be free to assemble and propagate their views without hindrance. . If you can amend the two clauses you may be able to proceed with the New Constitution smoothly.